Important note: Session URLs transmitted through the Zendesk integration are only accessible to Zendesk users that have access to a seat on your FullStory account. The FullStory App for Zendesk lets you see the most recent sessions for the customer who submitted a ticket. 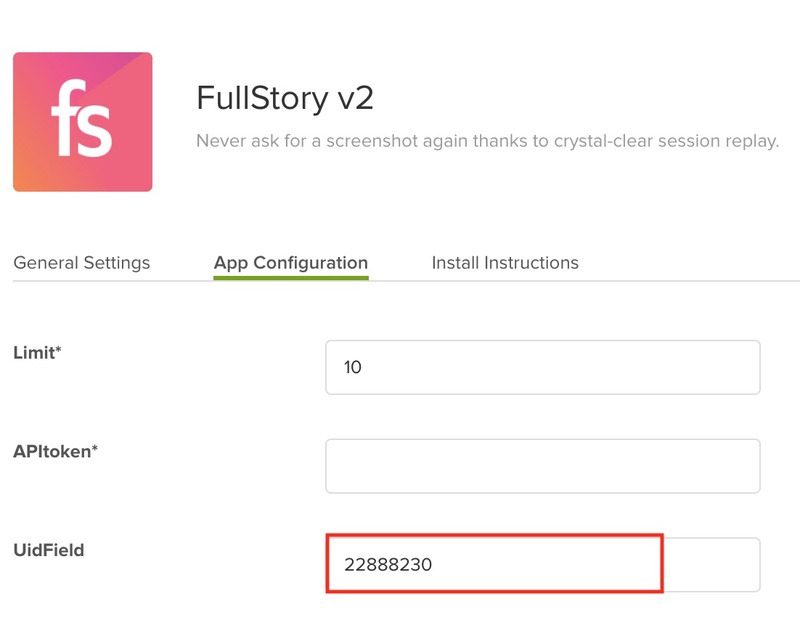 Before you begin, you’ll need your secret FullStory API key to connect your FullStory account with Zendesk. To find it, log into FullStory, click on the Settings tab in the left-hand sidebar, then select Integrations & API Keys. If there’s already a key listed there, great! If not, click the Generate button to create a new key, then click Save API Key. Copy the key to your clipboard so you can paste it into Zendesk. In your Zendesk account, find the FullStory app in the app store. Click the Install App button to install the FullStory widget on your Zendesk account. Optional: Enter the maximum number of matching sessions that you would like to see in the Limit field. Enter your API key from FullStory in the APItoken field. Click Update to save these settings. In Zendesk, click the gear in the lower left corner to access the settings, then select Ticket Fields. Find the field you're using to store user IDs and click edit. Note: If a ticket field doesn't already exist for ID, go ahead and create one via "add custom field". You can name it anything you want as long as it is a Text field. After you click edit, At the top of the field details page, copy the Custom field ID for the field. Click Manage under Apps in the main menu, then click Change Settings to access your FullStory widget settings. Paste the field ID that you copied from the ticket settings into the UidField box, found under the App Configuration Tab. That’s it! When you open a ticket, you'll see the FullStory widget in the Apps sidebar on the right (you may have to click the Apps button in the upper right to open the sidebar). If the user who submitted the ticket is found in FullStory, we’ll show links to their most recent sessions.